"Extremely low fat and tasty biscotti cookies. Perfect for dipping in hot coffee or tea." Combine the flour, sugar, ground almonds, baking powder and baking soda. 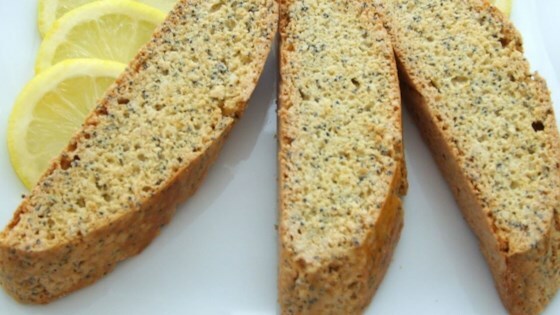 Combine the lemon peel, poppy seeds, egg, egg whites and lemon extract. Add the dry mixture and mix well. Form the dough into 2 logs. Place logs onto the prepared baking sheet. Bake at 350 degrees F (175 degrees C) for 30 minutes. Let cool slightly and cut diagonally into 1/2 inch slices. Bake slices another 8 to 10 minutes until dry. Cool completely and store in an airtight container. This was so easy to make. As previous members stated I added 6 tablespoon of lemon juice. i didnt have lemon extract. Also I added grounded up walnuts instead of almonds. Will use this again!